There is something captivating about the art and style of animated movies produced by Studio Ghibli. The design of the characters and the worlds may seem quite basic, particularly compared to it’s American counterparts, but in it’s simplicity there is a charm and beauty which gets you rooting for the characters from the very beginning. This is necessary because very little of substance or anything warranting any huge amount of attention occurs within the first twenty minutes. Two children move into a house which seems infested by “soot-monsters” and they chase them around. This is essentially it but the animation makes-up for the shortcomings in story. Or at least for a little while anyway. My Neighbour Totoro never really excites at all. It isn’t a movie designed to thrill or keep children on the edges of their seats but instead tells a slow, unfolding tale which deals with imagination, loneliness and the fear of losing loved ones. These are themes which have been dealt with in animation before but it is done very ably here, even if in a slightly cryptic manner. A loose imagination and the ability to suspend disbelief are essential if watching the film, but then again they always are with Studio Ghibli, as this is a film which includes a huge sleepy cat, small critters which scurry about in a funny fashion and most famously of all, a CatBus. The last of which balances precariously between charming and creepy, just about staying on the side of the former. It isn’t always enough to keep the movie interesting though and there are still passages of the film which go by featuring very little action or anything of specific consequence. It feels like a film crying out for some sort of action or set-piece as it is very easy for the attention to drift or the story to stop making that much sense. There is something resembling a finale, with an emotional moment, but this lacks the impact you’d hope for and doesn’t spark the imagination or the excitement it aims for. It is a shame because the creativity is definitely there. The story could use a deeper plot, or at least some sort of substantial sub-plot and any peril which is included in the movie could be increased so it actually mattered, rather than feeling fairly pedestrian and inconsequential in places. 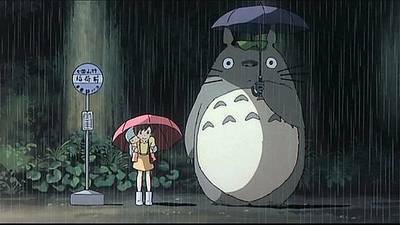 Overall, My Neighbour Totoro is classic Studio Ghibli, in that it is an imaginative, creative and beautifully crafted movie. Unfortunately it lacks depth, any kind of peril and suffers from a story which is far too simple but includes creative leaps sometimes a little too abstract. An interesting but very muddled movie.